Sacramento — Senator Tom Harman ( R-Huntington Beach ) announced today that Senate Bill 1058 has passed out of the Senate Natural Resources & Water committee. SB 1058 seeks to ensure that hunting license tag and stamp funds benefit game species and their habitats. 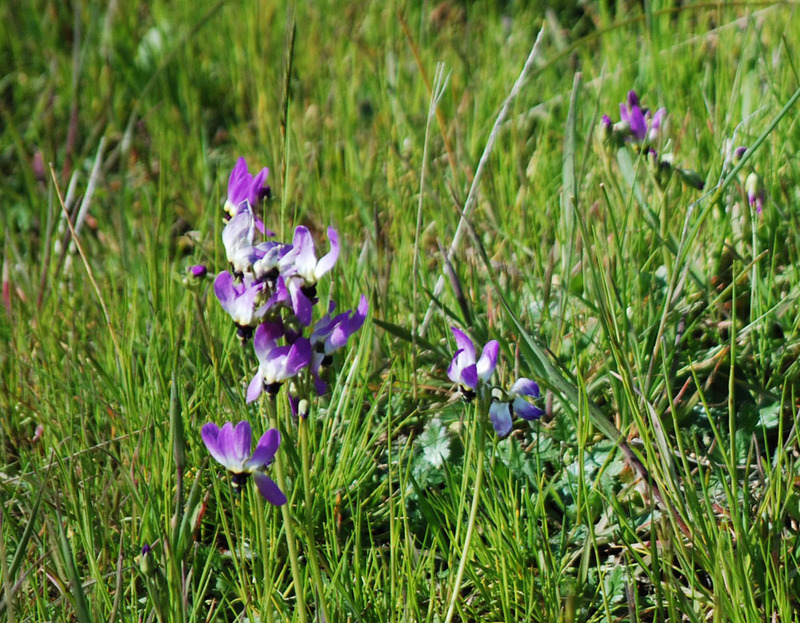 The bill is sponsored by the California Outdoor Heritage Alliance (COHA). “I am extremely pleased that my colleagues have demonstrated their dedication to conserving our environment by unanimously passing SB 1058 out of committee today,” said Harman. Current law, particularly as it relates to bear and deer tag monies, does not always require that the monies be used for a dedicated purpose. Unfortunately, these funds have been continuously used for non-game purposes. SB 1058 will require that, before any of these hunting monies can be expended, hunting-related organizations would have an opportunity to review proposed projects and provide comment to the Department of Fish and Game. “SB 1058 will further two causes that I am passionate about: increasing transparency in government spending and conservation of the environment,” said Harman. Senator Harman represents the cities of Seal Beach, Huntington Beach, Fountain Valley, Rossmoor, Costa Mesa, Newport Beach, Irvine, Cypress, La Palma, Los Alamitos, Laguna Beach, Dana Point and portions of Buena Park, Garden Grove, Santa Ana and Westminster. A big tom waits for attention. 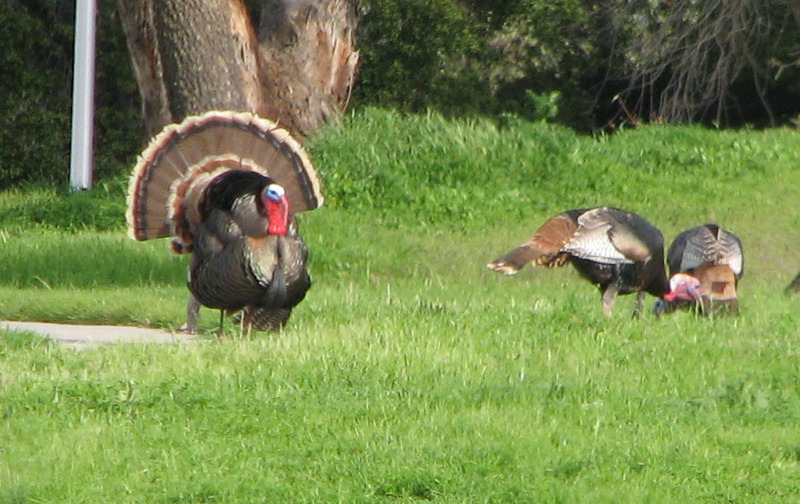 On the way home from turkey hunting, we stopped by the Livermore VA hospital to see watch the turkeys on the lawn. It was an impressive sight. Check out these video clips. Taylor McGannon with a nice gobbler. Last weekend was the youth turkey hunt weekend. The weather was perfect and the birds were active. 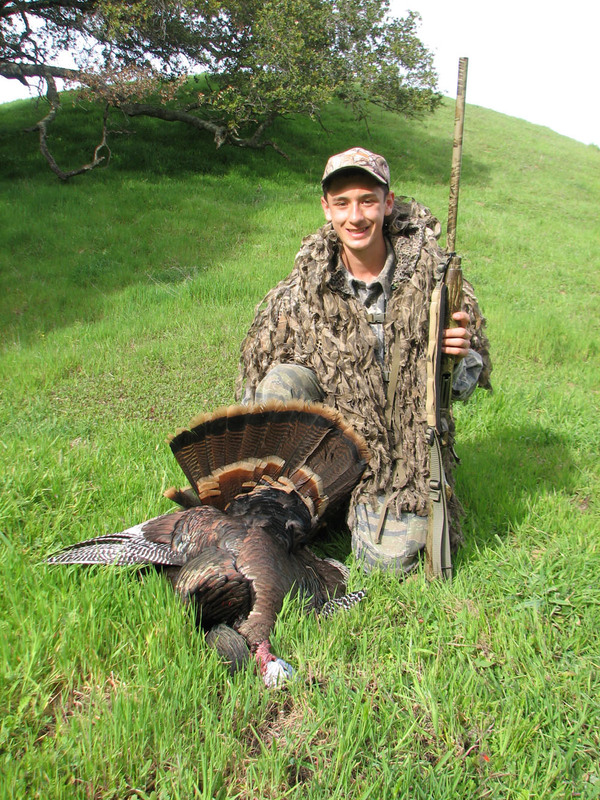 John McGannon purchased a turkey hunt at the San Jose MDF banquet and this was the perfect time to use his opportunity. 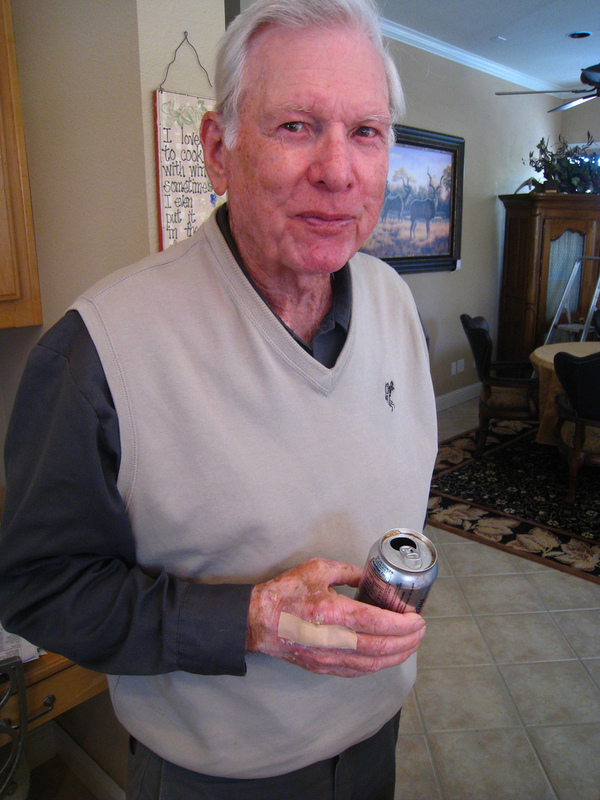 His sons, Ryan and Taylor, had their chances and Taylor connected. Here’s his account of the event. 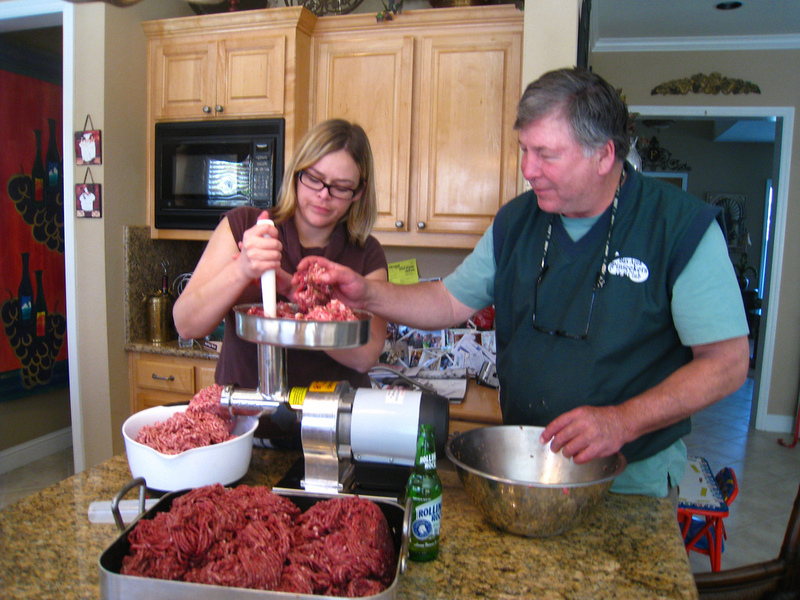 For the second consecutive year, daughter Betsy and I made sausage with venison, goose and duck breasts. We mixed the fowl with the venison and figured it would all work out in the end – which it did. 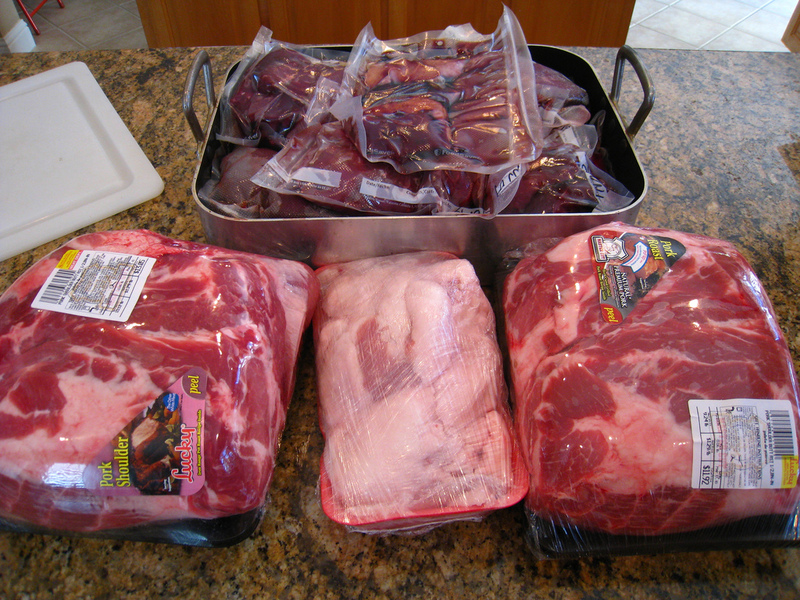 Snow geese, Aleutian geese, widgeon and spoonies joined with shoulder and rump meat from my buck. 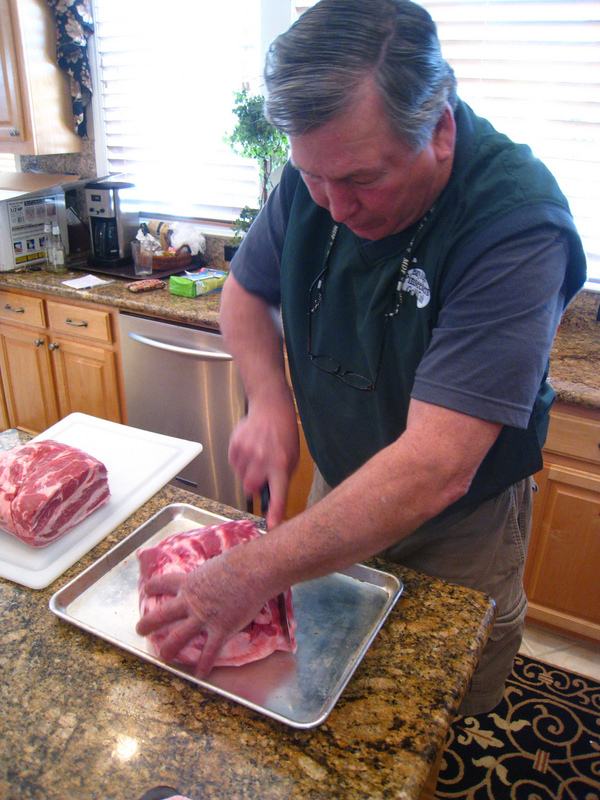 I found a couple pork shoulders at the local grocery store – ten pounds apiece. 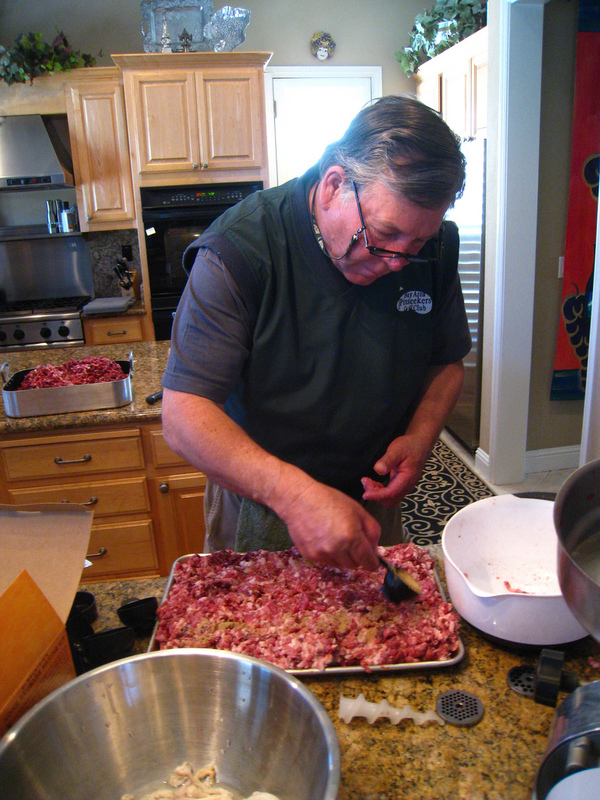 Combined with 20 pounds of game meat we had the makings of a bunch of sausage. I purchased sausage kits at Bass Pro. 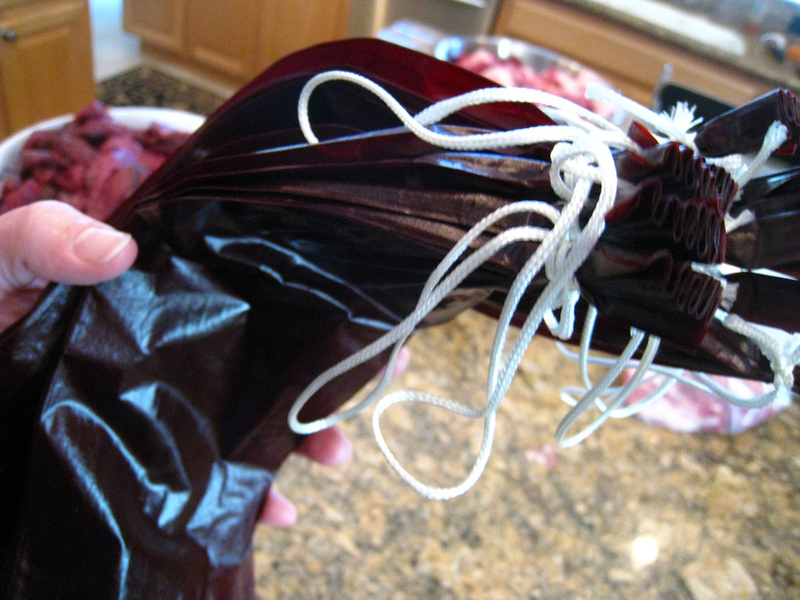 This made the process of gathering up materials and spices quite simple and I had enough to do to get ready anyway. We were very pleased with the product. Here’s a photo essay of our weekend efforts. 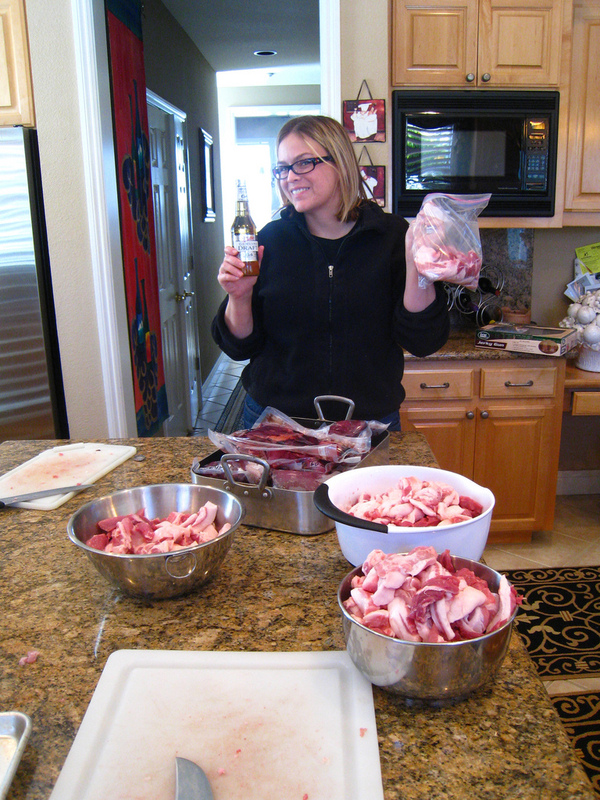 We sliced and diced the pork and venison. 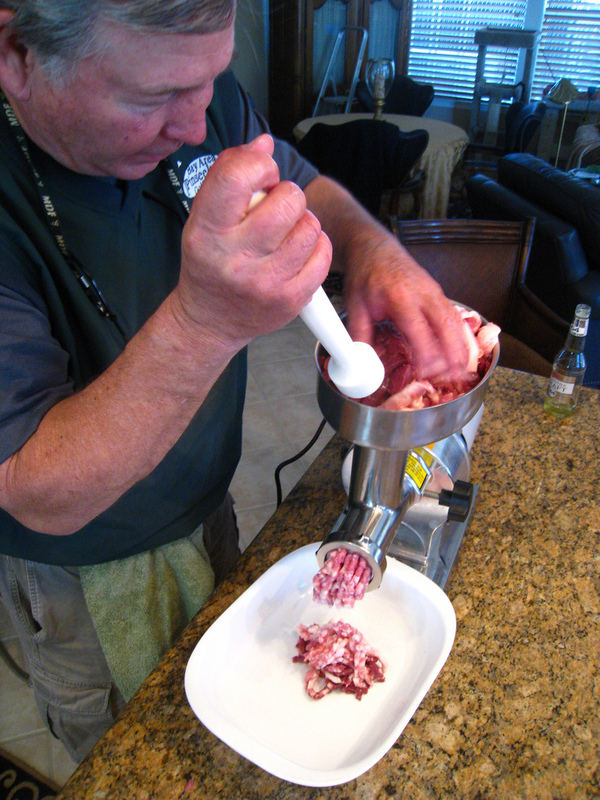 It's ok to have a beer while making sausage. 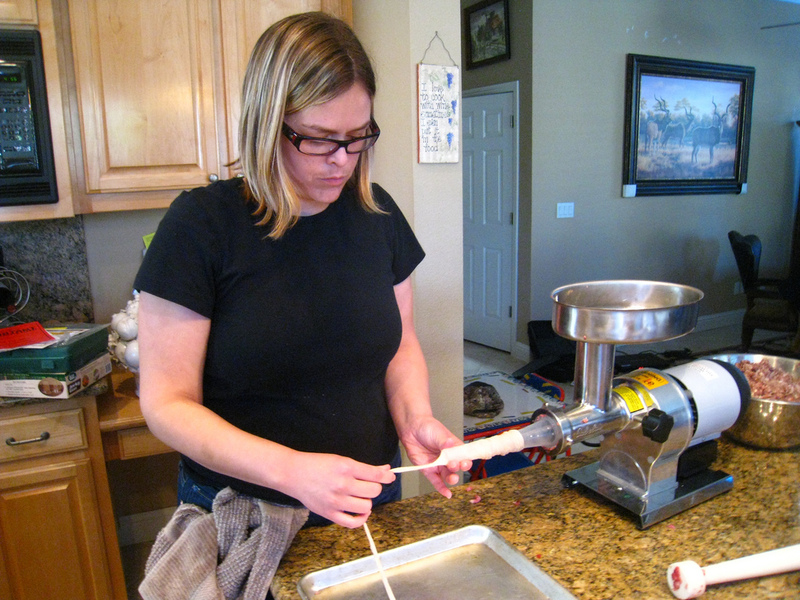 Casings come packed in salt. Rinse the casings to remove salt. Note the prepackaged sausage kit. 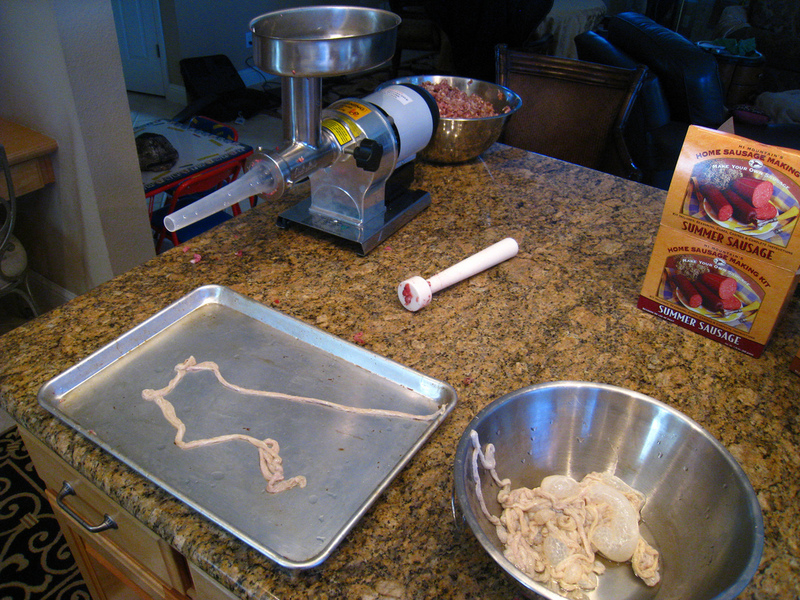 The casings must be soaked until soft. 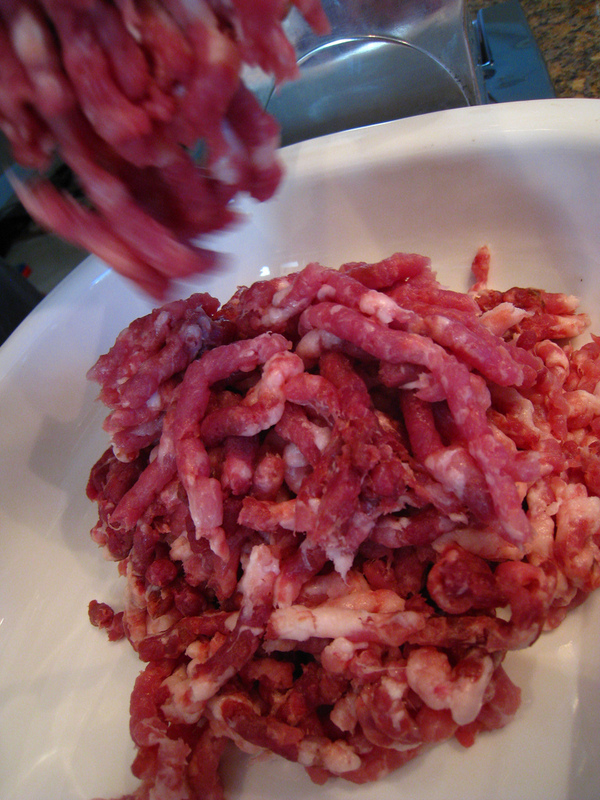 We ground the pork and venison together. I followed directions from the kit carefully. 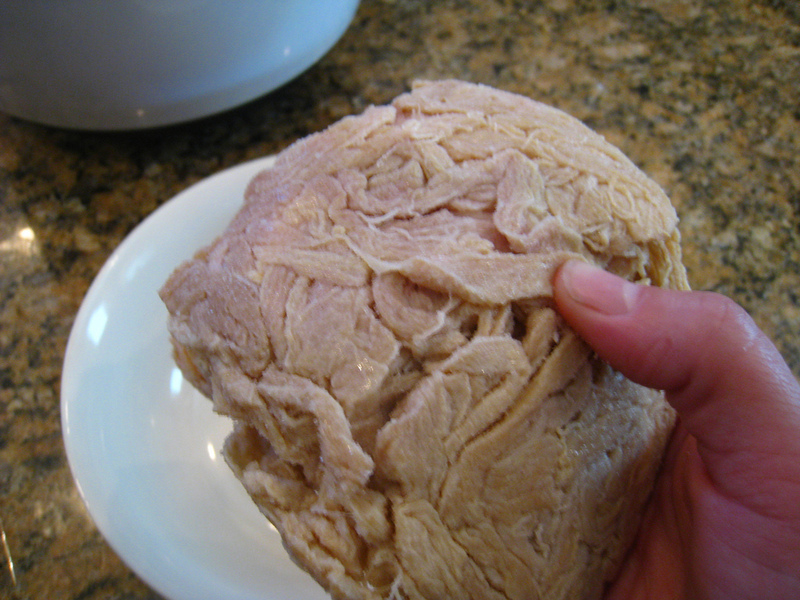 The meat after one pass through. 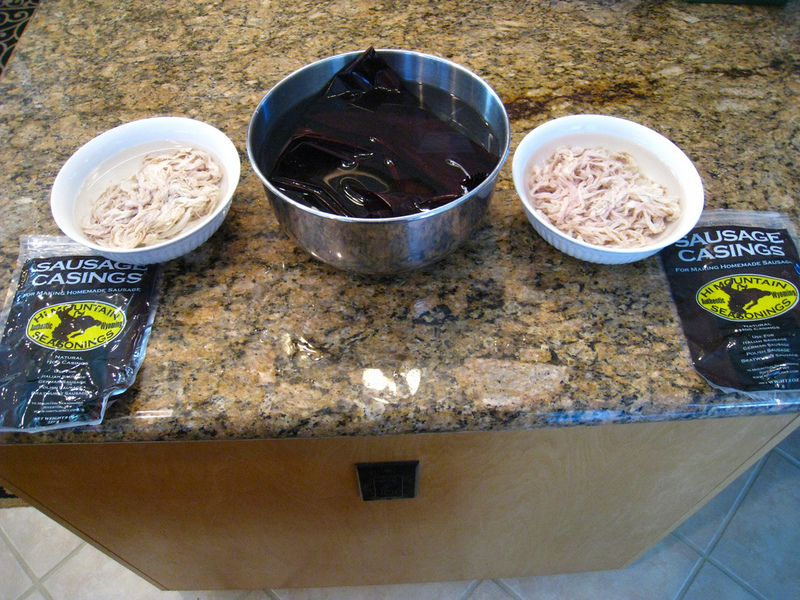 After the first pass we added seasoning and cure and then reground. 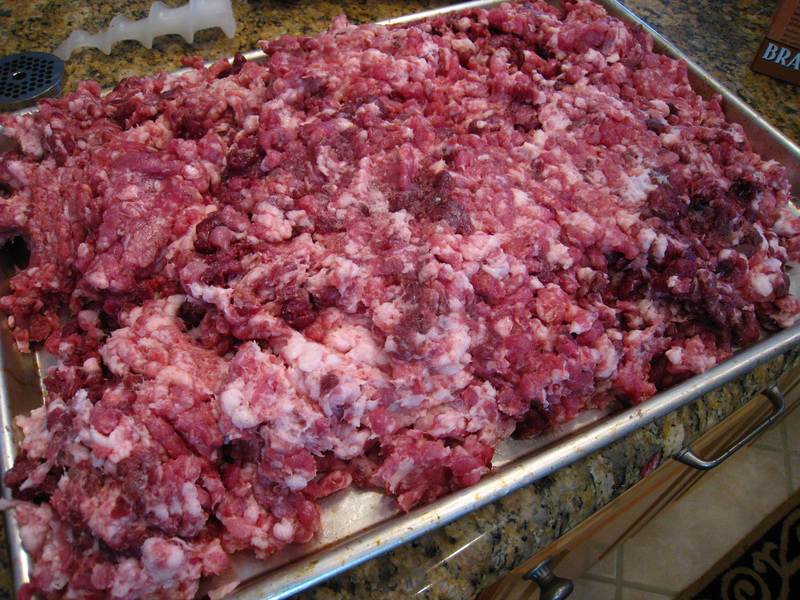 After regrinding and a night in the fridge, the meat was ready to be stuffed. 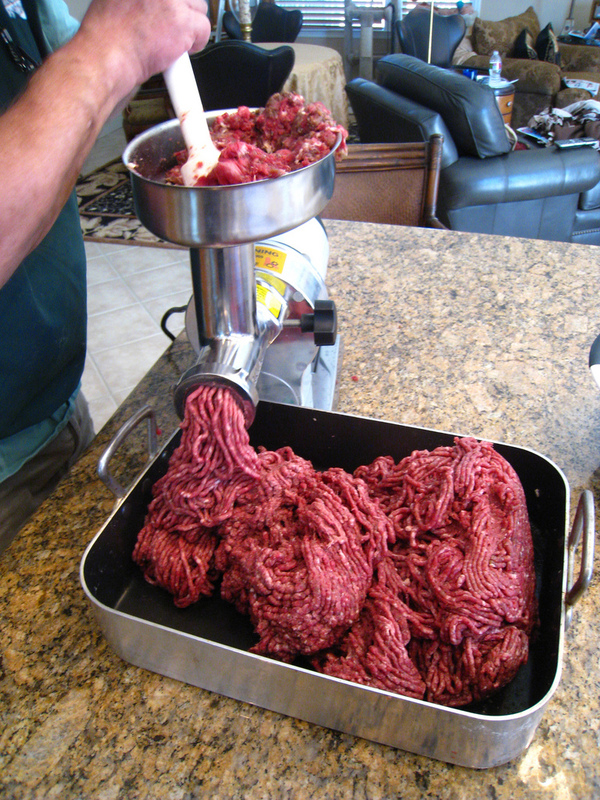 Summer sausage is 80% lean meat and 20% pork. 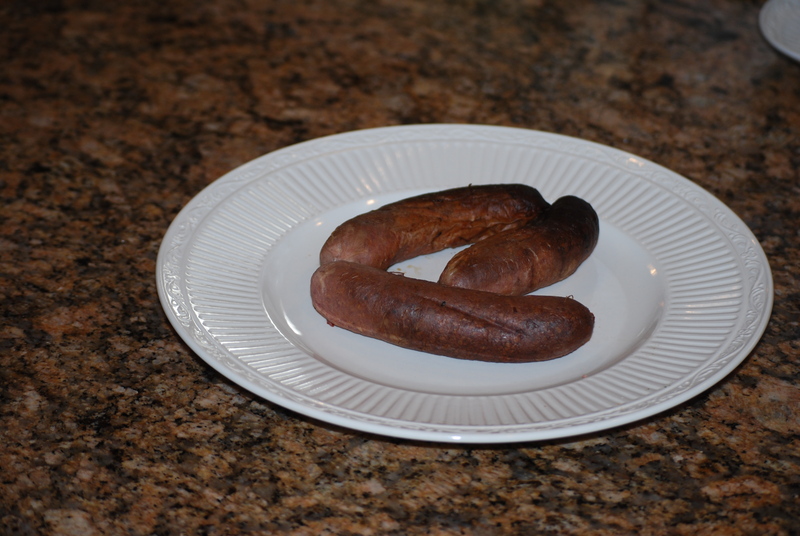 Polish and bratwurst are 80% pork and 20% venison, but you can go to 50/50 if you prefer a lean product. 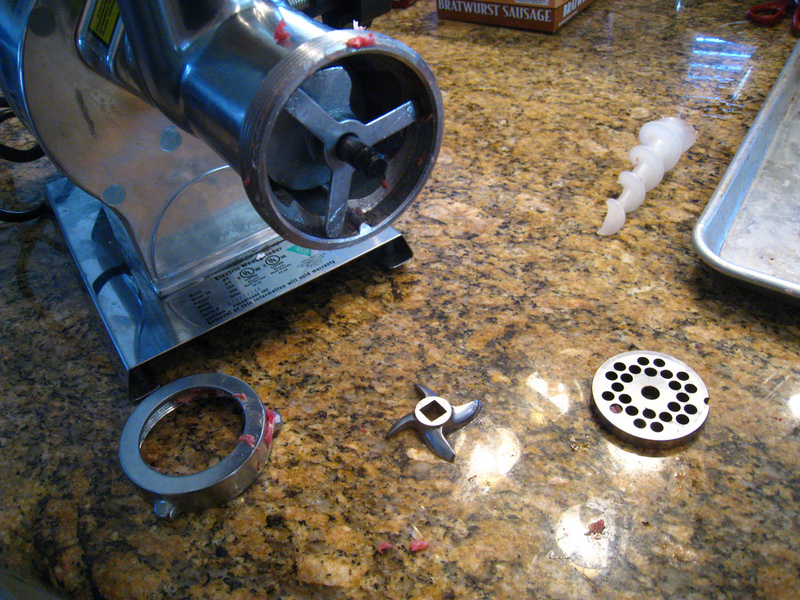 When the grinding was over, we switched the knife and grate (on the counter) for the stuffing blade - inserted into the grinder. 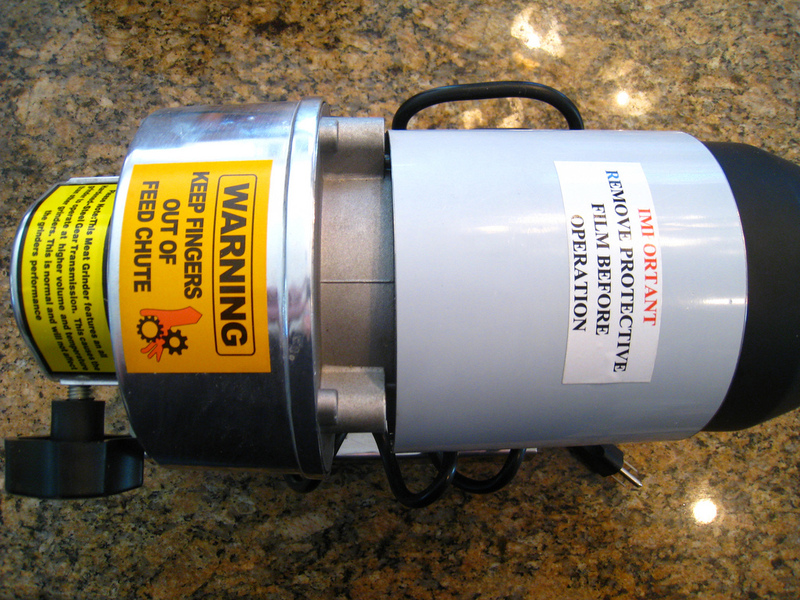 The casings slide over the stuffing tube. After it's in place tie a knot at the end. 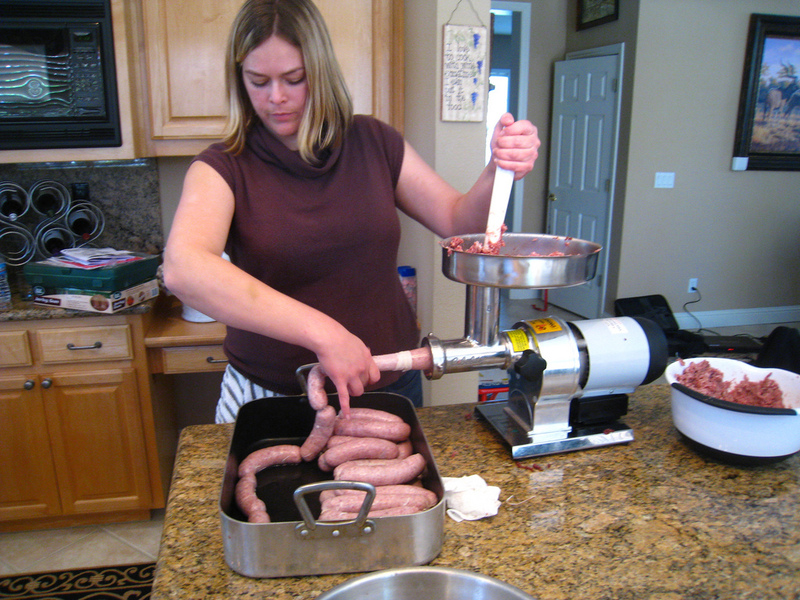 Betsy attempted to make sausage by herself, but it really takes two people, one to hold the sausage and the other to run the machine. 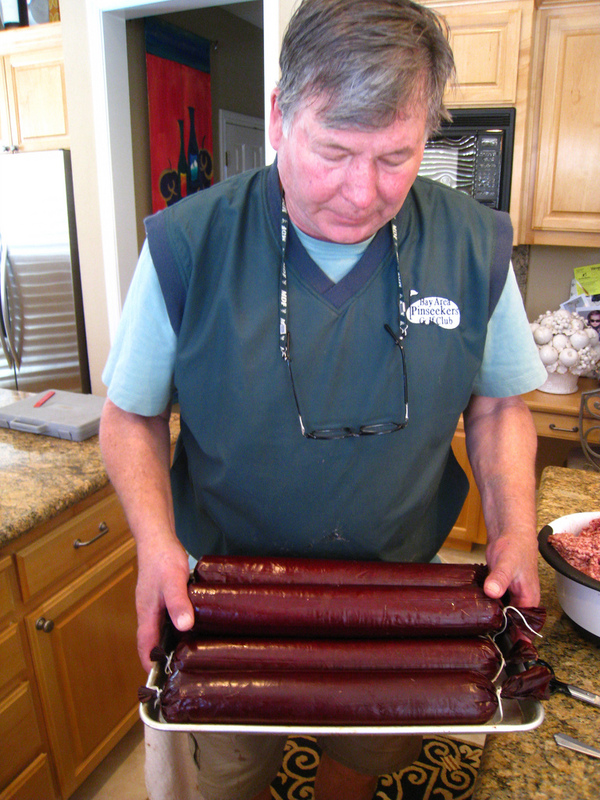 Summer sausage casings are quite large and a larger stuffing tube is used. 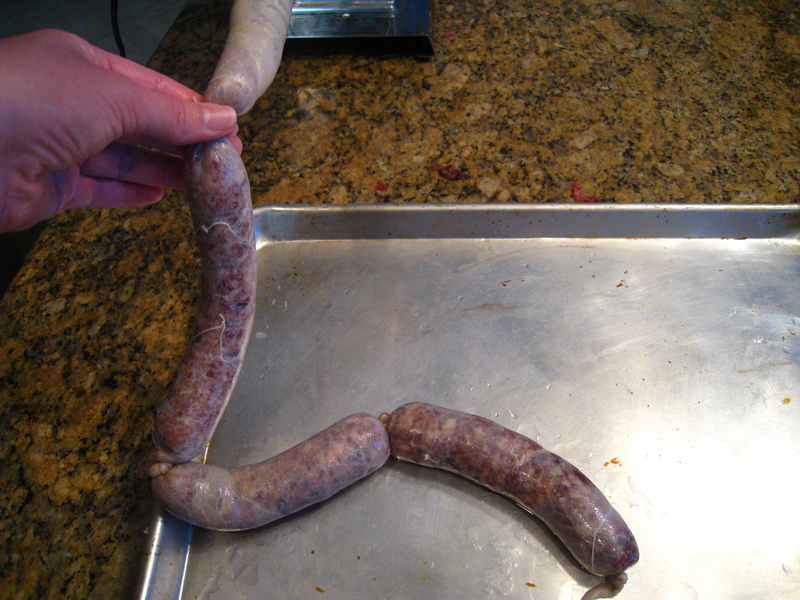 Twist the casings as each link reaches the desired length. The summer sausage made us laugh. Dad stopped by to supervise for a while. 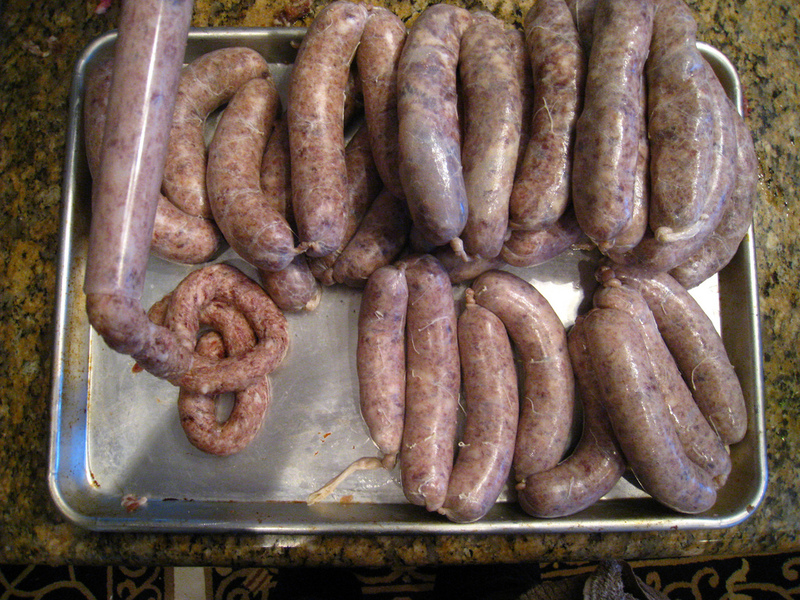 Polish links with a little left over for smoked sausage patties. 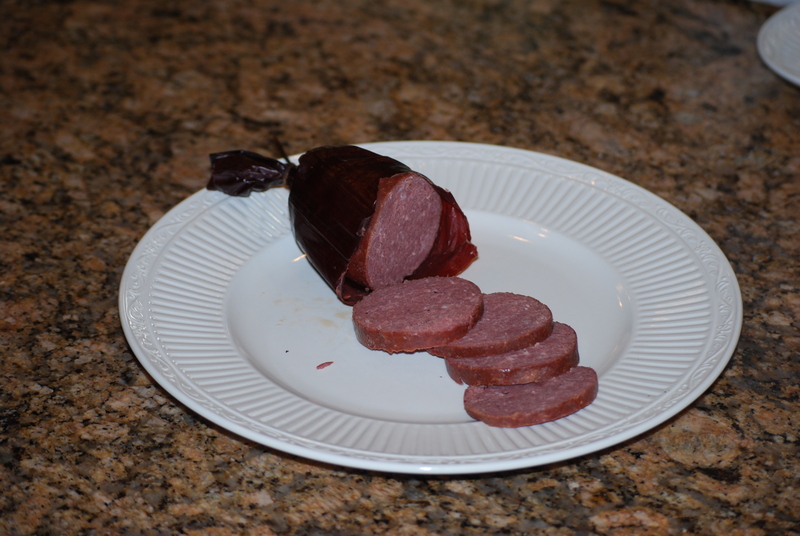 I was quite proud of the summer sausage. 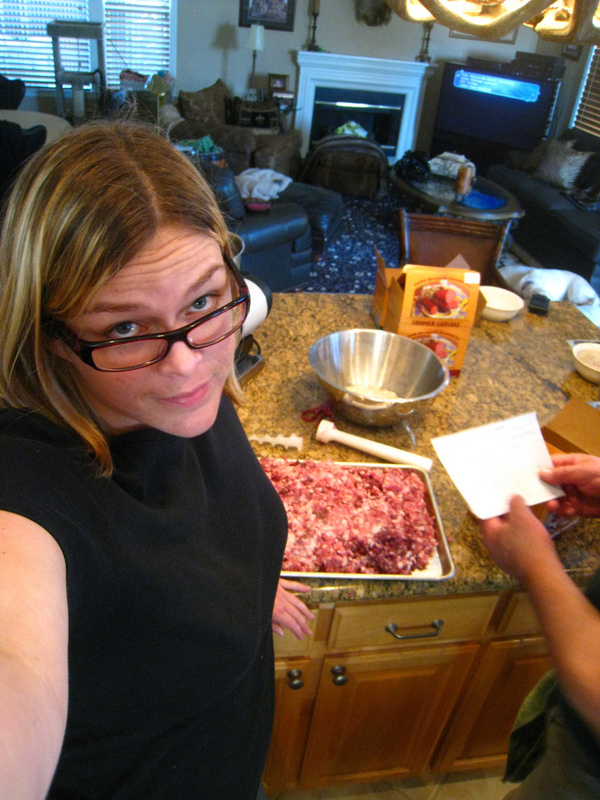 We ended up with 15 pounds of summer sausage. 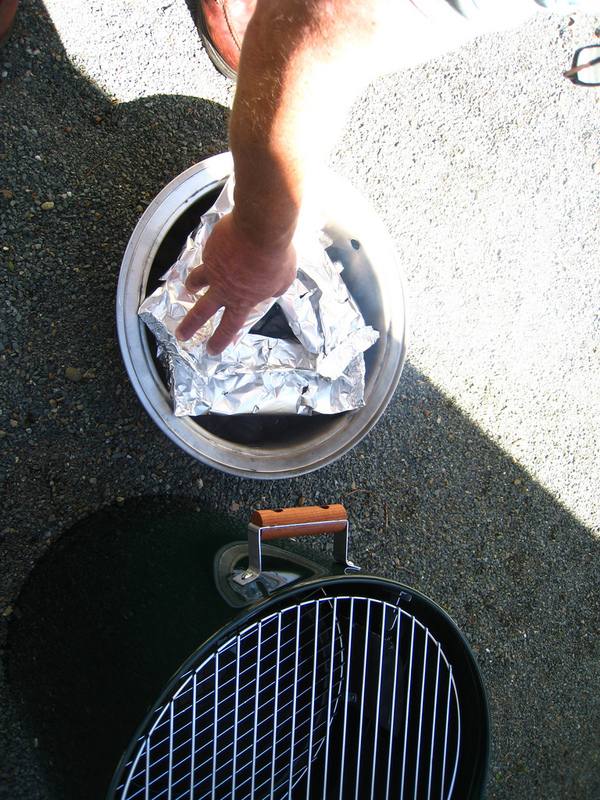 To prepare the smoker, I place apple wood chips inside aluminum foil. 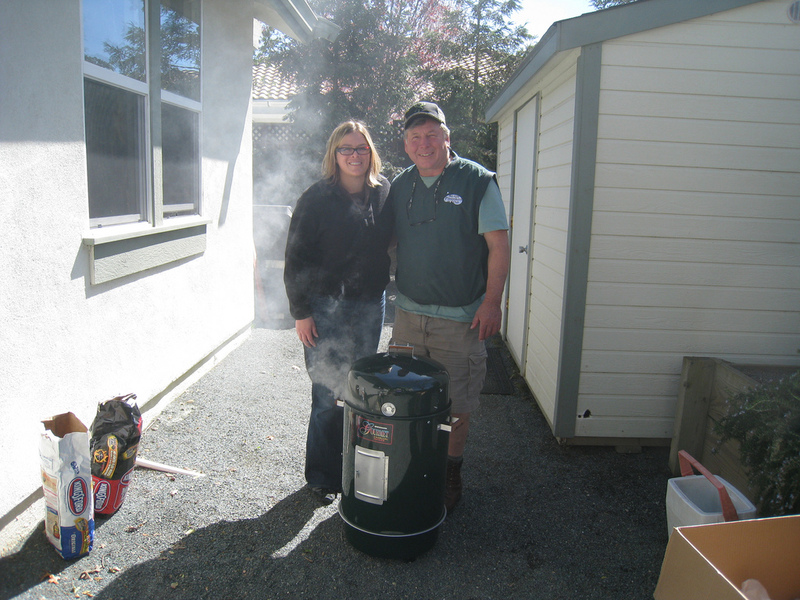 This created an appropriate amount of smoke and heat when placed over the coals. 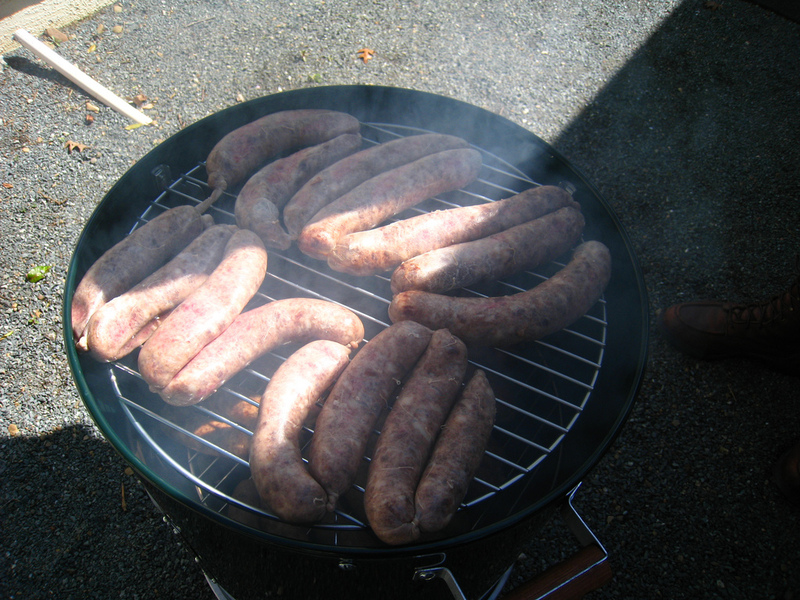 After three hours of smoking, the bratwurst reached the 160 degrees necessary to be safe. 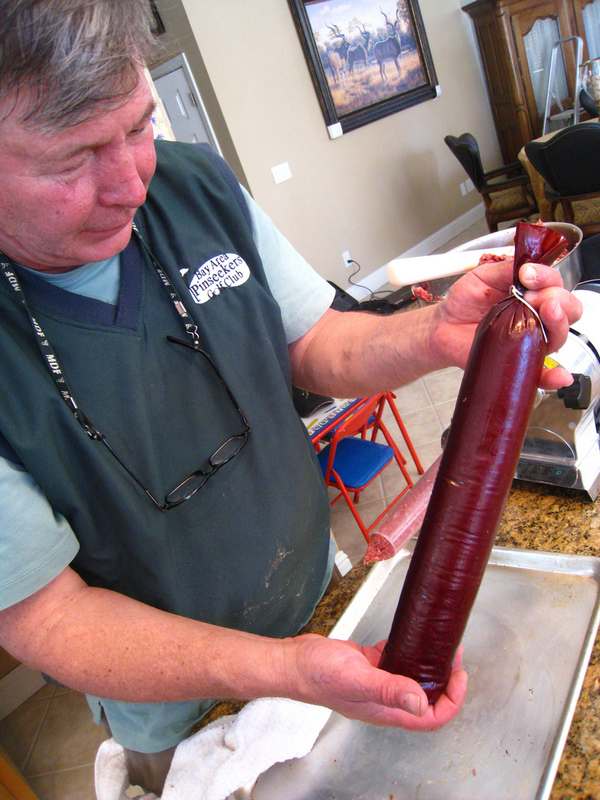 The summer sausage is fabulous. 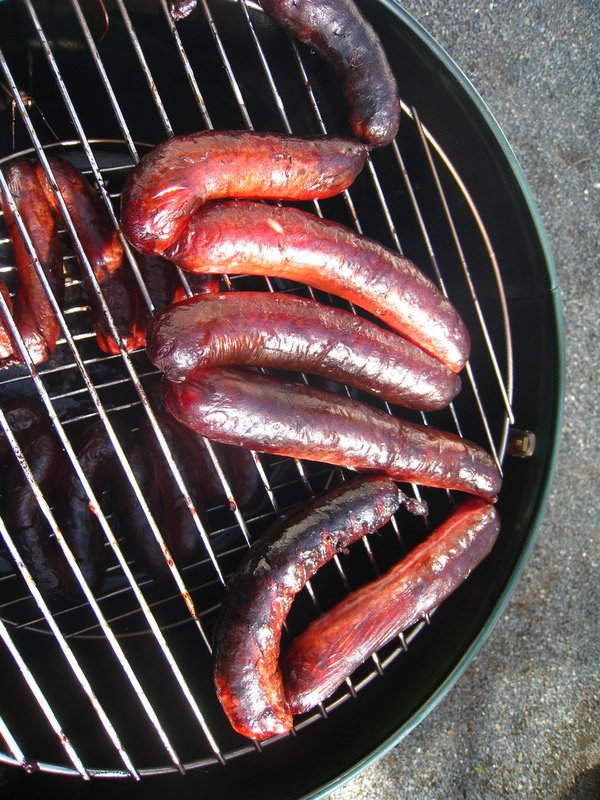 The bratwurst and polish have an excellent smokey flavor. What a great way to share your game with friends. The pond repairs will produce water for cattle and wildlife. 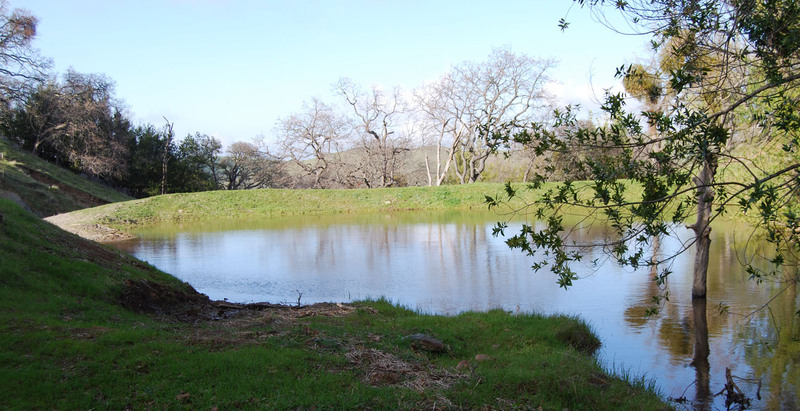 Stock ponds are also breeding habitat for endangered amphibians, the California red-legged frog and California tiger salamander. The winter rains were well spaced and appropriately timed for good results. We were quite lucky to have optimal conditions, conditions that allowed the bare ground to sprout the seeds we sowed. Here are a few photos showing that the ponds did well. This pond was deeply incised in the spillway area. We built up the dam and finished off the spillway with many loads of rock and other material. 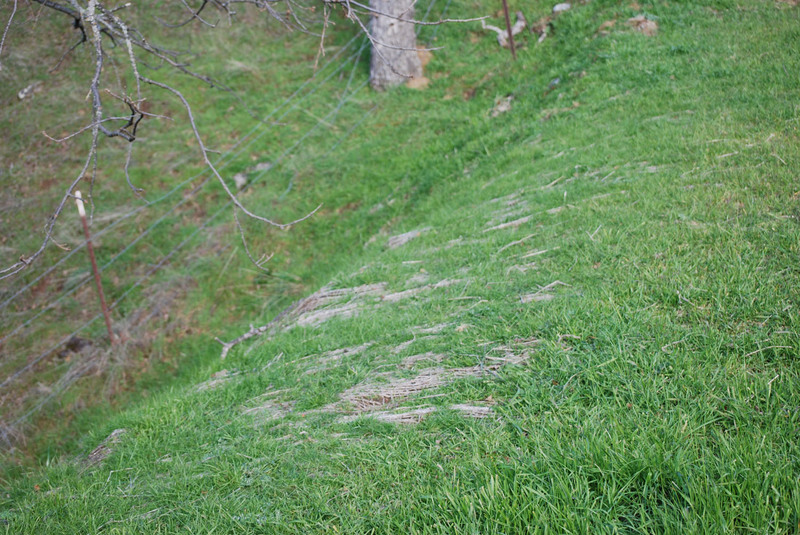 The dam wall showed almost no erosion. Jute matting, straw and native seeds were spread over the bare dirt after we finished rebuilding the dam. 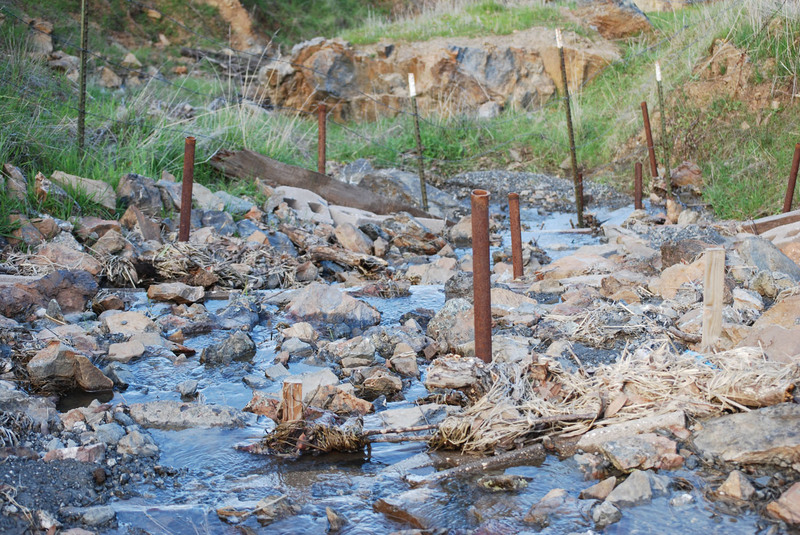 The gradual spillway was loaded with rock, bricks, boards and pipes driven into the ground for support. Spring flowers were popping. Along with shooting stars, johnny jump ups and buttercups were showing. 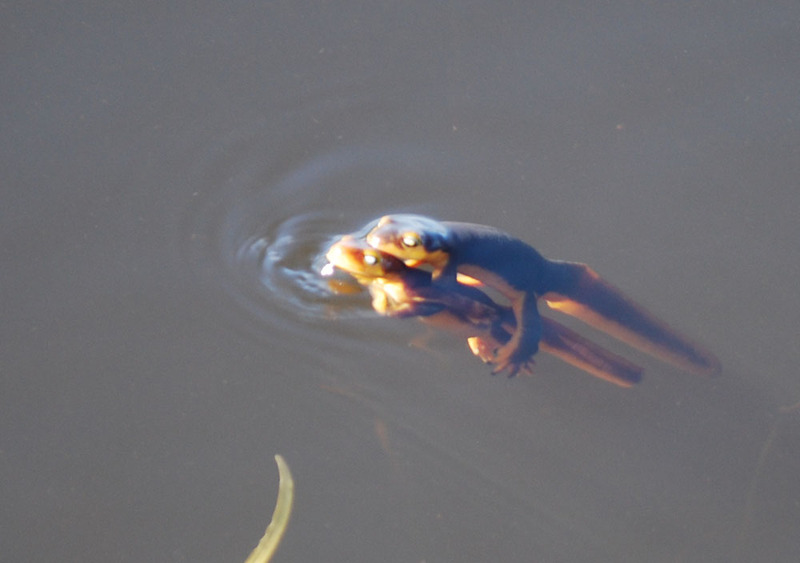 California newts were the most visible amphibians. It was a great spring day until about 4:00 PM when clouds appeared to the West and I decided to make my way home before the roads could get slippery. I recently received the following email. The question was so appropriate that I decided to make a post on the topic. I bought a 100 acre property here in Ontario, Canada in January with three partners. We have known each other for over 25 years and have hunted together forever. We are starting to build our new camp this spring. I have been doing research on the net to find a document we can use and all agree on and sign for our camp. I am looking for something that may cover a member’s sudden death, buy outs, passing shares on to spouses or children, divorce and anything else that may pop up. I joined a few hunting forums to try and get some advise and possibly a copy of an other camps document, but all I seem to get is the old “be careful” speeches and not much more. A lot of people seem to have partnership agreements, but no one seems to want to share them with me. We have contacted a lawyer to draft an official document, but he told us if we could get a document already completed and just modify it to our situation it would be a lot cheaper. Rich, would you have a copy of a partnership agreement that you could share with me? Dear Ontario: It would not be appropriate, or much true help, for me to give you a partnership agreement from California. Penny wise and pound foolish would be an applicable phrase. I am not the best source to provide you with such a document. I am a real estate broker in California and I do have some experience with partnerships. I also have a copy of a partnership agreement around that I could provide. A lawyer is an expert in the law and also trained at producing clear agreements without ambiguity. Many of the clauses you need for your agreement have stood the test of time and an attorney understands how they apply. I do not do legal work. Undoubtedly the laws of Ontario Canada are different from the laws of California, both from a real estate and a partnership prospective. I could be accepting some liability by going so far as to provide a document – and it makes no sense to me to create liability as a blog writer. However, I do have a layman’s experience and I am willing to pass along some guidance – guidance that a lawyer may not provide. You must think of the partnership relationship you and your partners want to create. I believe that the best partnerships are created amongst groups that have commonality of goals and also similar starting points. As partnerships age, often the group splits as each individual moves in their own direction. Having a common starting point also creates a degree of equality among partners, making it difficult for one person to dominate. And, it creates the basis for common goals. Sometimes partnerships create limitations on the ability of partners to sell their interest. For example, partnerships sometimes allow partners to sell out only for their initial cost, plus some accrued interest. This type of partnership creates a situation where partners have little or no profit. Accordingly, there is no motivation to ever sell and little investment incentive. These agreements typically have a first right of refusal agreement built-in so the group or remaining partners have the first opportunity to purchase when an individual partner decides to sell. First right agreements tend to devalue each partnership interest. Typically the logic is that control over the membership is necessary to protect that group from exposure to undesirable individuals who could ruin the quite enjoyment of each of the group members. This is understandable. However, I am not a fan of this type of agreement. I prefer an agreement that follows typical real estate investment strategies where each individual has a right to sell their interest in the partnership at fair market value. I believe this model produces a better investment incentive for people who have limited funds. Partners are able to withdraw their funds and reinvest when necessary. If money is no consideration for any of the partners, or a degree of benevolence is present for some of the partners, the “no profit” concept can work, but this is not typically a healthy partnership situation from my prospective. An alternative method of protecting both the real estate business interests of the group and also the quite enjoyment of the hunt club is to create two entities. One group holds title to the property and the other leases the property from the real estate group. The two groups may be exactly the same people or they can be different. If a hunting partner wants to sell his real estate interest, he can do so and the protection of the recreational aspect will be provided by the operating agreement between the lessees. And, the lease provides some annual income to create a degree of investment incentive for the investor-owners. In other words, create two partnerships. This also adds flexibility to the group. If an individual owner moves away for a while, the group may be able to find somebody to be a lease partner until the real estate owner returns. When he returns he can assume his place in the hunting lodge again. 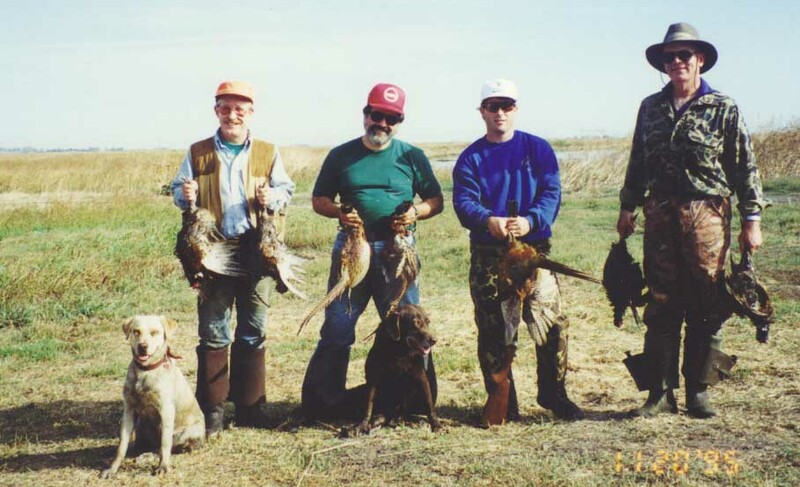 If one of the owners gets into a financial bind, he may be able to sell his interest to a non-hunting owner and continue to hunt even though he can no longer afford to be an owner. The purchaser may decide it’s a worthwhile investment based upon the lease income. When a property has multiple uses, it’s possible to have hunting and non-hunter partners for other reasons as well. Diversity is often a good thing. The makeup of the partnerships in which I’ve been involved has changed over time, but eventually we seemed to find the “right” guys and subsequently have remained together for quite a while, despite the fact that each of us has our own unique style. It’s quite a bit like marriage. Oh my…..
A private ranch unguided elk hunt near Craig Colorado has been added to the Livermore-Pleasanton Chapter banquet-auction to be held on March 11, 2010.The hunt will take place with the Craig Wild Bunch http://www.elk-craigwildbunch.com owned by Willie White. (970)824-9334. This is a five-day unguided hunt on 3800 acres. The hunter can also apply for a mule deer tag if he wishes. Camping is allowed on the ranch or the hunter can choose to stay in town at a motel. The hunter can bring along a non-hunter at no charge. An elk tag must be applied for before April 6, 2010. A three-man duck hunt in the Butte Sink will be auctioned for the benefit of Field of Dreams, a program created by Tom Dermody. This program provides outdoor opportunities to disabled children and children of veteran killed in line of duty. The hunt will be guided by Dermody. This is a lightly- hunted private ranch located in prime duck country.